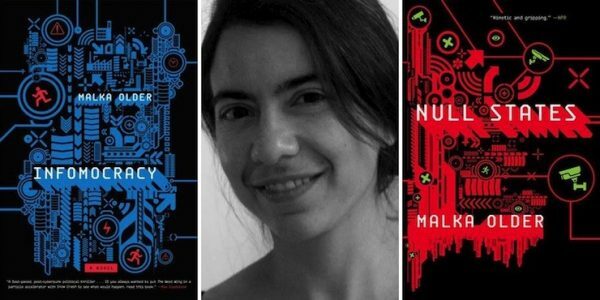 Malka Older #HispanicHeritageMonth « Adafruit Industries – Makers, hackers, artists, designers and engineers! Today we recognize science fiction novelist and disaster specialist Malka Older! Malka Older is a writer, aid worker, and PhD candidate. Named Senior Fellow for Technology and Risk at the Carnegie Council for Ethics in International Affairs for 2015, she has more a decade of experience in humanitarian aid and development, ranging from field level experience as a Head of Office in Darfur to supporting global programs and agency-wide strategy as a disaster risk reduction technical specialist. In between she has designed and implemented economic development initiatives in post-disaster context; supervised a large and diverse portfolio as Director of Programs in Indonesia, and responded to complex emergencies and natural disasters in Sri Lanka, Uganda, Darfur, Indonesia, Japan, and Mali, in the last three as Team Leader. Her doctoral work on the sociology of organizations at the Institut d’Études Politques de Paris (Sciences Po) explores the dynamics of multi-level governance and disaster response using the cases of Hurricane Katrina and the Japan tsunami of 2011. As part of this work she has been selected as a visiting scholar at Columbia University, on an Alliance Grant, and at the Fletcher School of International Affairs at Tufts University. She has an undergraduate degree in literature from Harvard and a Masters in international relations and economics from the School of Advanced International Studies (SAIS) Johns Hopkins University. Her research interests include intra-governmental relations in crises; the paradox of well-funded disaster responses; measurement and evaluation of disaster responses; and the effects of competition among actors in humanitarian aid (. She has also conducted research for the French Institut de Radioprotection et de Sûreté Nucléaire (IRSN) on the human and organizational factors involved in the Fukushima Dai-Ichi crisis.